Though there have been ovens as long as people have been cooking (any covered vessel or firepit containing food and heated from an external source may be said to work on the same principle as an oven), it was not until tribes stopped wandering and settled into stable non-nomadic groups that ovens began to be developed past the rudimentary stage. (Interestingly, ovens were apparently developed worldwide independently by peoples who had no knowledge of the folks 6000 miles away. )Flues were added as was insulation to prevent fires from escaping and to ensure a continuous heat. As these little villages moved from hunting food to growing it, grains and grasses were harvested, dried, ground, and made into breads. Likewise, yeast has captured and used in cookery since 4000 BC (give or take a few years), making leavened bread possible. It probably wasn't great bread, but provender is provender. When your main objective in life is to escape the plague, the Barbarians at the gate, and Things That Go Bump In The Night, seeking out the perfect baguette is low on your priority list. For the next several millennia, cooks dealt with the imperfections and fluctuations of ovens heated with wood, coal, oil, kerosene, peat, and dung (yes). Given the guesswork involved in gauging oven temperatures as well as the laughably vague recipes passed down from previous generations of cooks, there must have been an enormous failure rate for baked grain products. It wasn't until the first quarter of the 20th Century that ovens with temperature regulation became widely available, coinciding with a brief mania for a "scientific" approach to food preparation. As modern kitchen equipment & techniques evolved with precise temperatures and measurements spelled out, perfection seemed virtually guaranteed. Nowadays the plague, Barbarians, and ghoulies & ghosties & long-legged beasties aren't as worrisome as they once were, so we have the luxury of enjoying perfectly-baked bread and related foods for more than just their life-sustaining properties. It may seem a few giant steps backwards, then, that purveyors of bread products are now embracing a return to wood-fired ovens. Why would anyone in their right mind willingly give up the convenience of gas- or electric-fired ovens to stand over a huge primitive oven, feeding it handfuls of wood, just to bake? You can talk all you want about the purity of such foods, the creation of artisan breads & pizzas, exploring ancient methods of food production, but the only answer that matters: it's better. Bruciante Wood Fired Pizza opened on Hilltop Drive late last year in a kiosk formerly occupied by a drive-through coffee flogger. 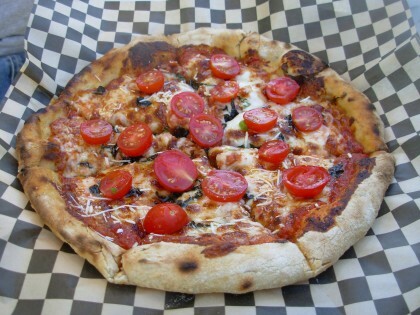 Pizzas are made to order and baked on a portable wood-fired oven hauled around on a trailer. It takes no longer and costs no more to get a 10-inch pizza than it does to go into a cafe and get a sandwich - and this is truly wonderful pizza. Just because there's always someone who says, "Oooh, I'm on a diet," Bruciante makes a colorful, delicious house salad, and it's worth ordering whether you're on a diet or not. 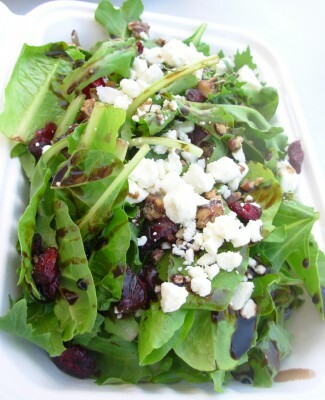 Mixed organic greens with dried cranberries, candied pecans, a choice of blue cheese or feta, and a perfect blend of Lucero olive oil and balsamic vinegar - this is one of the very best salads in Redding, and at a bargain price. We picked the last tiny leaves out of the container and squabbled over the last of the balsamic-soaked cranberries. Blue cheese on a pizza? Yes, please. This tangy pizza combined bits of top sirloin, blue and mozzarella cheeses on red sauce, Femme de Joie requested cooked tomatoes to be added for an acid bite to contrast with the rich cheeses. 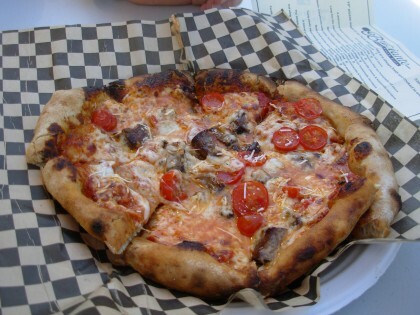 This was the first pizza we tried at Bruciante, and how very fine it was. M. de Joie and Amico del Signore exulted over the tender crust that still supported the ingredients without collapsing, the quality of ingredients, and the smoky edge of wood-fired flavor. A variation of the classic margherita pizza, smoked mozzarella substitutes for plain and gives the impression that you're eating a pizza with meaty flavors. A thin drizzle of basil olive oil set off the raw cherry tomatoes (added by request) beautifully. Think of bruschetta - this was a like a cheesy baked bruschetta, though not overwhelmed with so much cheese that it was a fatty globule atop a crust. In addition to the house salad, Bruciante makes a special salad every day. 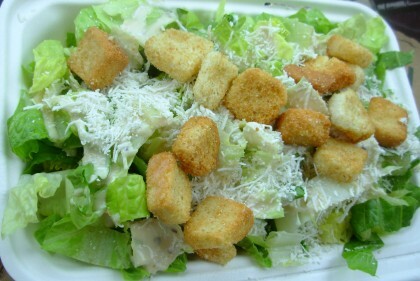 Caesar was the traditional Romaine lettuce with a lemony-tart creamy dressing, croutons, and mizithra cheese in place of the usual Parmesan. Femme de Joie practically requires anchovies on her Caesar but recognizes that most people run screaming from the room if faced with one of those salty, oily little fillets, so she will let this matter slide for now. The mizithra cheese almost made up for it. Not familiar with mizithra? Well, if Parmesan is subtle, earthy and aged, the essence of umami of cheeses, then mizithra is sharp, snappy, and in-your-face. Chicken on pizza has never appealed to M. de Joie. It just seems so wrong. 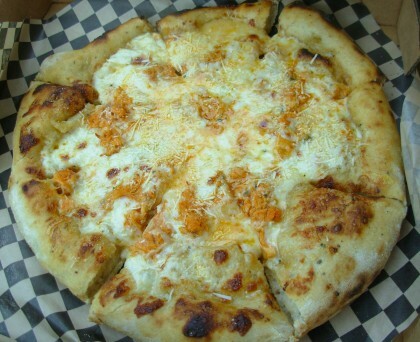 But here the chicken breast is shredded into a spicy Buffalo-wing sauce to keep it moist - none of those odd little moon rock-like pellets of desiccated chicken here - and topped with mozzarella, blue cheese, and more of that delectable mizithra cheese. For full enjoyment: have cold bottles of beer in refrigerator. Put beer mug in freezer. Call Bruciante and order Blazin' Buffalo (maybe two). Go pick up pizza and bring home. Pop open beer, pour into frozen mug. Stuff face. You'll thank us later. Let us be clear: this is not pizza as most Americans think of pizza. No pile-it-all-on combinations. No extra-gargantuan-stuffed-crust pizza to feed six people. You don't have a choice of twenty-five toppings. No, this is the Mies van de Rohe of pizza. The ingredients are sourced locally and organic if possible - you can get an additional veggie (say, zucchini or bell peppers) from the farmer's market added to your pizza for one measly buck; sometimes Sweetie's Barbecue is called up to provide smoked meats for specialty pizzas. Dough and sauces are house-made. It's too bad that beer isn't served because this pizza really deserves a cold one with it, but that problem is solved by taking it home and enjoying it there. M. de Joie wasn't expecting to see top-quality pizza in Redding anytime soon, so the appearance of Bruciante has made her - and A. del Signore - very, very happy. This place deserves to succeed. Bruciante Wood Fired Pizza, 2491 Hilltop Drive #C, at the corner of Commerce (north of IHOP in a parking lot by Remax), Redding. 530-242-6128. Open Monday-Friday, 11:00 AM - 7:00 PM. Cash, cards. Closed weekends. Drive-though or eat at one of the tables. No alcohol. Vegetarian & vegan options. Small parking lot on-site. Follow them on Facebook here.